This attractive Tudor-style library building was opened on April 16, 1931. The Detroit Public Library located it here to serve the rapidly growing upper middle class neighborhoods that lined Oakman Boulevard near Linwood. It was designed during Detroit’s decade of most substantial population growth. The interior is timbered consistent with its Tudor exterior. A great deal of attention was paid to locating this building on its site and to landscaping its campus. 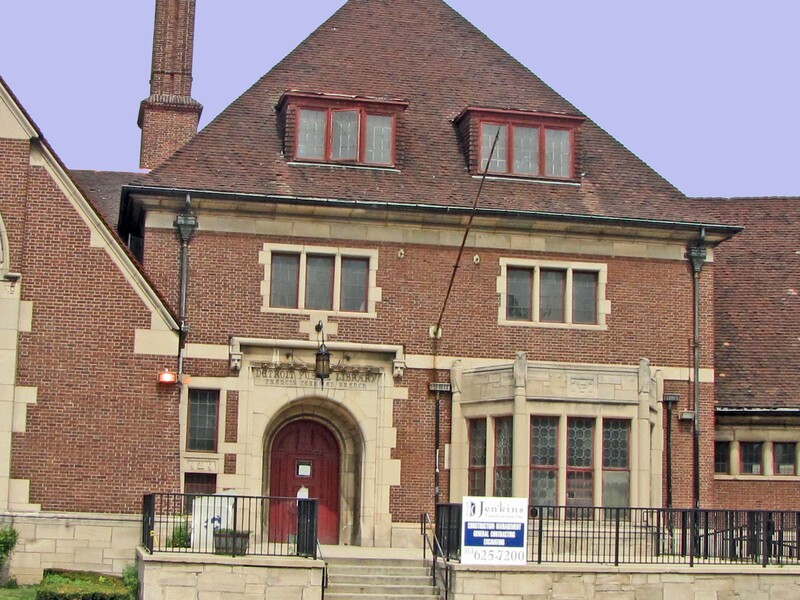 It was the eighteenth branch library opened by the Detroit Public Library system. This library honors the accomplishments of Francis Parkman who was, arguably, the nation’s most prominent Nineteenth Century historian studying the contest between the English and the French to dominant North America. Since the Detroit area was a major theater for that conflict, it is appropriate to recognize his achievements in the Motor City. Parkman’s great grandfather graduated from Harvard in 1821. His grandfather became a highly successful merchant and that was the source, I believe, of the family’s fortune. Francis Parkman’s father, also a Harvard graduate, was a prominent Boston Unitarian minister. Born in Boston in 1823, Parkman graduated from Harvard in 1844 with a very strong interest in history. He immediately traveled to the West Coast and wrote a book about the overland trails that then connected California and Oregon to the rest of the United States. Then he took up the endeavor that occupied much of the rest of his long life—the study of how the English were able to eventually expel the French from North America. He wrote at least seven volumes on this topic, but I believe that the individual volumes are often seen as distinct books addressing specific issues such as the French exploration of the Great Lakes. Parkman spent time in and around Detroit interviewing people whose ancestors had first-hand information about the contest between the European powers. He also recognized that Indians could contribute to his understanding since various tribes were recruited as allies by both the French and English. He interviewed Indians in Michigan and in western states to augment his knowledge of what had happened a century or more earlier. In 1851, he published A History of the Conspiracy of Pontiac, describing the briefly successful efforts of Pontiac and his warriors in the early 1760s. Parkman also published a volume describing LaSalle’s expeditions in the Great Lakes and the Mississippi River valley. Parkman had an interesting career. He published at least one novel but it was not acclaimed. He became interested in roses and published about them. Indeed, he amassed so much knowledge that he was appointed to teach horticulture at Harvard for several years in the 1870s. He also had an interest in photography. In the last quarter of the Nineteenth Century, there was much agreement that American Indians would quite soon disappear. Their death rates appeared to be very high and those who observed them saw their population steadily decrease in size. Quite a number of photographers, including Francis Parkman, sought out Indians to photograph in their native dress and habitat. I believe that many of his photographs have been preserved. Although Parkman was seriously ill at several points in his life, he reached age 70. Twentieth-century historians who specialize in the history of the colonies write extensively about Parkman’s work. Almost every decade, a large new book is published reviewing Parkman’s endeavors. It is not that his work is seen as inaccurate. More recent scholarship may lead to different interpretations of some of the events and people that Francis Parkman described. Some critics, writing from the perspective of the Civil Rights era, presume that Parkman was too strongly influenced by the cultural values of the Nineteen Century that deprecated the abilities and contributions of Roman Catholics and American Indians. The Parkman Library was shuttered on March 31, 2010 for a renovation. Use in 2010: This branch of the Detroit Public Library is temporarily closed for remodeling. The Parkman Branch opened at its present location on April 16, 1931. It is named in honor of the American historian, Francis Parkman. This branch was the eighteenth in the Detroit Library system and the second to be designed according to a regional plan. The building is situated on a triangular site and the interior features the half-timbered early Tudor style. Some of the special services and programs this branch offers include a computer lab, a substantial African-American collection for children and adults, popular fiction and non-fiction books, and the Friends of Parkman Branch, which has been active for several decades. Parkman is located at 44°57′19″N 107°17′37″W (44.955199, -107.293584). According to the United States Census Bureau, the CDP has a total area of 9.6 square miles (24.9 km²), of which, 9.6 square miles (24.8 km²) of it is land and 0.02 square miles (0.05 km²) of it (0.20%) is water. Parkman Daze is a one-day annual summer event featuring a parade, chuckwagon feed, live music, and a poker-style horse race. This entry was posted on March 12, 2009 at 1:48 am and is filed under Uncategorized. You can follow any responses to this entry through the RSS 2.0 feed. You can leave a response, or trackback from your own site.